The Axe Origin features an array of newly designed technological aspects (much like their counterparts the Element and Elite) aimed to enhance performance and comfort. This bat utilizes a single piece construction made up of Axe’s LP1 Alloy. This strong aluminum material held within the 2 5/8 barrel delivers maximum pop, stronger durability, and an explosive sound. The big barrel also comes equipped with a reengineered hitting zone that enlarges the sweet spot, increases durability, and optimizes overall performance throughout a 270-degree contact area. The handle features a HyperWhip end cap that decreases weight, increases swing speeds, and extends barrel length. Much like the 2018 Axe Elite and Element, the 2018 Axe Origin features an Endogrid technology upon the handle used to absorb any shock vibrations thus creating a smooth and comfortable feel. We think it definitely comes at a great value for what it delivers. The Origin is considered one of the best valued youth USA bats currently available for purchase. 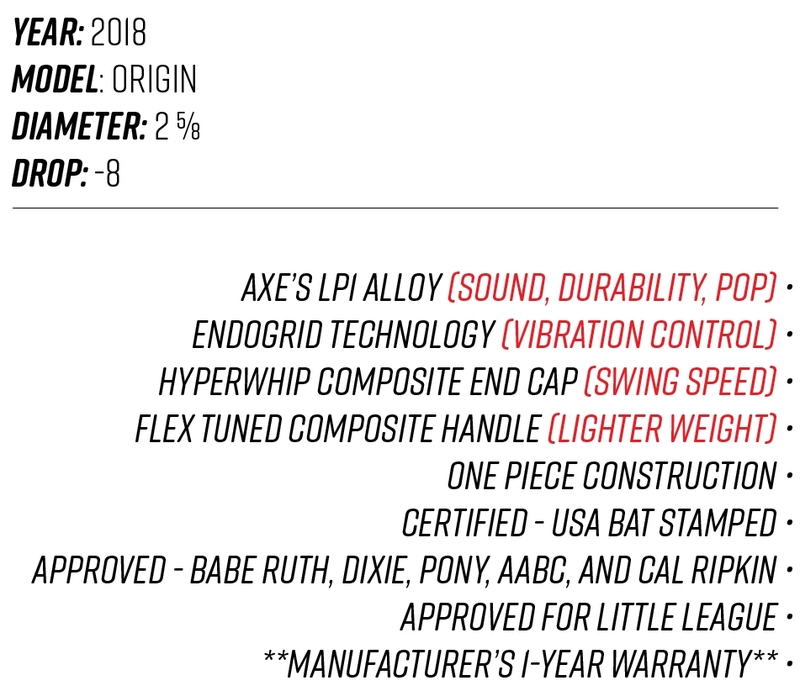 Going into the evaluation, our staff understood that the Axe Origin would most likely pack a bit less pop than the other Axe USA bats. What this youth bat lacks in power, it surely compensates with speed and balance. The Origin offers a very light swing weight design as a means to assist youth players with increasing their bat speed and attaining supreme confidence. When testing, we chose younger and less experienced volunteers for hitting with the Origin. After recording enough data for analysis, below is our official review of the 2018 Axe Origin. As our staff expected, the Origin provided our hitters with plenty of line drive potential yet lacked a bit of the distance other youth USA bats delivered. Please note, the primary focus of this youth baseball bat is to assist with increasing bat speed and NOT enhancing power. With the new USA bat standard limiting the potential for pop, do not expect any 2018 youth USA bat to outperform 2017 model bats. After conducting our evaluation, the Axe Origin ranked in the lower half of USA bats for the pop and distance category. When analyzing how the Origin handled the prevention of shock vibrations on the hands, our staff only holds an observational standpoint. After analyzing the feedback, it earned mixed reviews when protecting against vibrations. Out of all the volunteers who swung out the Origin, about 30% reported consistent stings. Our staff does not recommend using this youth baseball bat in divisions where kid pitch can reach speeds of 60 mph or higher nor do we recommend swinging this USA bat in a batting cage chucking balls at more than 70 mph. Cold climates also might not work for this bat. When analyzing the strength and durability of the Origin, we thoroughly examined all aspects of the barrel and handle looking for any significant damage that could come in the form of cracks, dents, or dings. Each youth bat we evaluated definitely took quite a beating after incurring 200-300 swings. Despite showing some handling marks and scratches after over 300 solid contact swings, the Origin held up well cosmetically. As stated above, the Origin is an excellent choice youth bat to use as an entry level bat for younger ball players who are making their way into the era of the USA Bat standard. This bat is not recommended for the youth players who play in higher divisions of kid pitch. If your son or daughter has a difficult time locating pitches in the strike zone or displays a tendency to not swing a level bat, this youth bat is a great introductory tool.